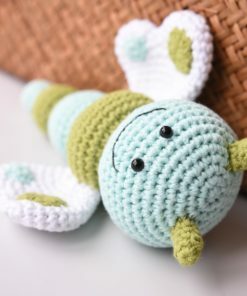 This colorful and sweet butterfly rattle will make any baby happy! Unisex colors. 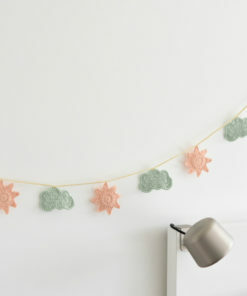 Handmade using cotton yarn mixed with polyester, durable and soft. Makes a nice rattling sound. 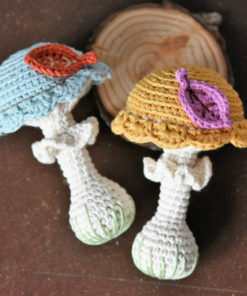 This colorful and sweet bee rattle will make any baby happy! Unisex colors. Handmade using cotton yarn mixed with polyester, durable and soft. Makes a nice rattling sound. 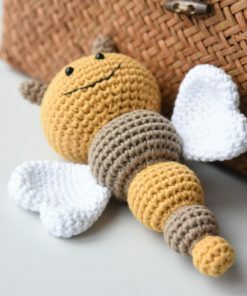 The most popular amigurumi pattern by lilleliis in many different languages! 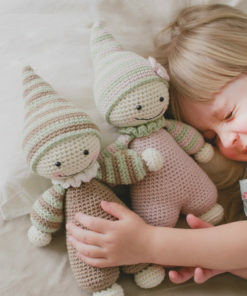 Crochet your little one the cutest baby-doll ever, so she can feel the warmness of her mom`s heart every day! Cuddly-baby is designed to be soft and baby-safe. When giving the Cuddly-baby to your child only for sleeping, it is a good way to teach them to understand when it is time to go to sleep. Also you may show them how to take care of the baby - feeding, cradling, putting to sleep etc. 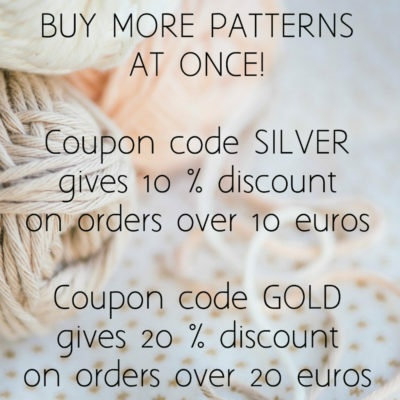 Pattern available in English, Spanish, Portuguese, French, German, Dutch, Danish and Russian. 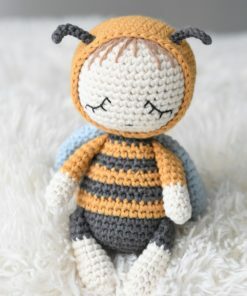 Little baby bumble bee is a nice gift for a newborn. It has no hazardous pieces. Made using soft mixtures of cotton. Her face is hand stitched to keep it as soft and sweet as possible. 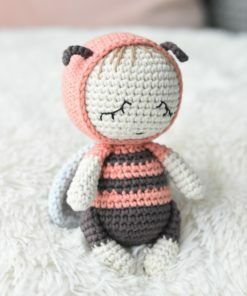 Little baby bumble bee is a nice gift for a newborn. It has no hazardous pieces. Made using the purest organic cotton. Her face is hand stitched to keep is as soft and sweet as possible. Cute teddy in a striped pajamas and a sleeping hat. 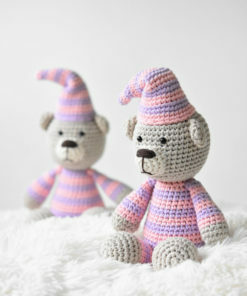 Makes a beautiful gift for newborn and babies. 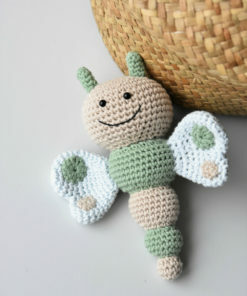 Sweet butterfly rattle will make any baby happy! Made in unisex colors. Organic cotton in beautiful pale shades is skin and environmental friendly. Makes a nice rattling sound. Classic woolen teddy bear in boys colors. Cute body shape, eye patches and details of flower printed cotton fabric. 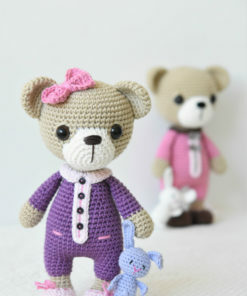 Handmade teddy bear is a friend for a lifetime and is therefor a wonderful gift for a newborn or a baby. 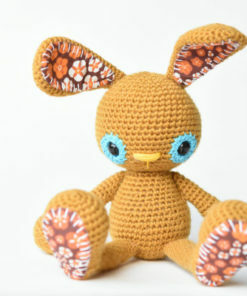 Rainbow bunnies are colorful and soft toys. Bright colors and lovely details of fabric make Mustard a real eye-catcher. The bunny has long feet and it sits nicely. Great for both playing and cuddling. Made with 100% natural woollen yarn.